One of the brightest parts of spring is strawberry season. We have a large patch of strawberries in the garden, and we’ve been making pies, cakes and all manner of tasty, fresh desserts. But what about something a little more savory? DH and I set out to make something with strawberries besides sweets. We came up with these Strawberry-Balsamic Toasts. 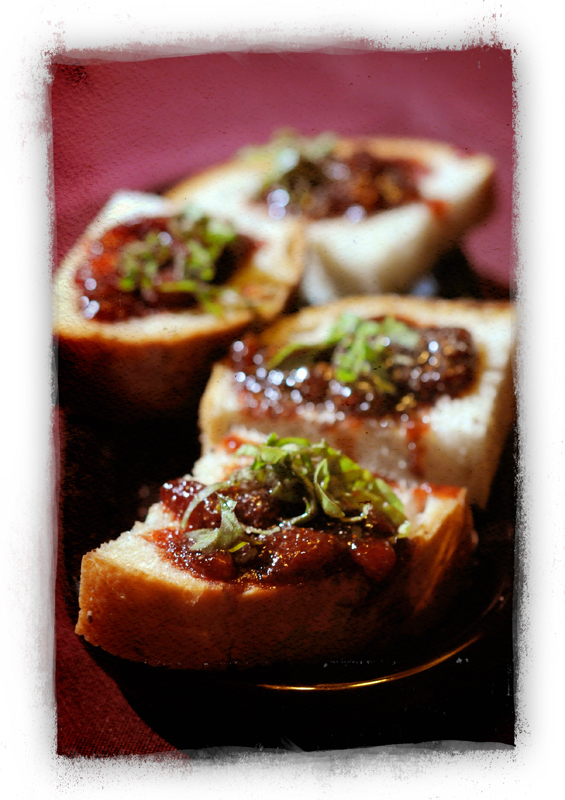 They’re an elegant appetizer and have a sophisticated, uptown flavor. We hope you will enjoy them as much as we did! Over low heat, combine vinegar, sugar and strawberries in a heavy-bottomed saucepan. Stir frequently and cook for 25 to 40 minutes, until liquid reduces by half and consistency is thick, like syrup. Meanwhile, brush quartered bread with olive oil and toast in oven while vinegar reduces. Toast bread for 10 to 12 minutes, until crispy and lightly browned. Remove from oven. When vinegar and strawberries have reduced, spoon evenly over toasted bread. Sprinkle with white pepper and salt, and top with basil chiffonade. We first discovered Kale Chips from New Family Naturals at the DC Veg Fest last year. We bought a bag and devoured them while we walked around the festival, deciding what else to eat. But it was recently at the Baltimore Veg Fest we got to actually catch up with these nice folks – and buy more of their delicious chips! New Family Naturals is a small family-owned business based in northern Virginia. Their product line came to be because they wanted healthier food choices for their own family to munch on: real food, not packages of weird ingredients you need a chemist to decipher. All of their products are hand-made with vegan/vegetarian and wheat-free foods designed to feed your body and soul. They even give 5% of their annual profits to a local charity. In 2011, that was a group called Helping Hungry Kids. The line includes Nacho Cheesy Kale Chips, Spicy Nacho Kale Chips, Mexican Spice Flax Crackers, Pizza Italiano Flax Crackers and Thai Spice Salad Topper/Trail Mix. You can buy these treats online or at a variety of Farmer’s Markets in northern Virginia. They’re all about $6 bucks per bag and worth it for every tasty crunch!!! The Nacho Cheesy Kale Chips are good eats. Our only comment – keep coming north! We’d love to be able to get these savory morsels in Maryland, too. Yum! In the interest of full disclosure, I have to confess, neither of us has tasted authentic green chile sauce. We’ve both been to the western U.S. regions where it’s made, but somehow, never tried it. Still, when I was watching a TV chef prepare a green chile casserole recently, I was inspired to try making a vegan version. The recipes I found online all were dairy-heavy, so to make it creamier, we used pureeed white potatoes in the filling and topped the whole thing with Daiya. Want it creamier? You could absolutely add some soy sour cream to the potato filling and it would work well. Boil potatoes in water or veggie stock until soft, about 15 to 20 minutes. While the potatoes cook, make the green chile sauce by adding canned green chiles, garlic, lime zest & juice, cumin, oregano, salt, black pepper, poblano peppers and all cilantro into a food processor. Pulse to combine until smooth and liquid. Pour into a bowl and set aside. When potatoes are soft, drain and add to empty food processor with taco seasoning and spinach. Blend together until spinach is incorporated and potatoes are creamy. Add a few splashes of water if needed to make it smooth. To assemble, spray a casserole with non-stick spray and spread about 1/3 of the green chile sauce on the bottom of the dish. Spread out the six wheat tortillas on your counter and equally distribute the refried beans – about 2 tablespoons per tortilla. Smear beans into a line in middle of tortillas. Next, equally divide the potato/spinach mixture between the six tortillas. Smooth out, like with the beans. 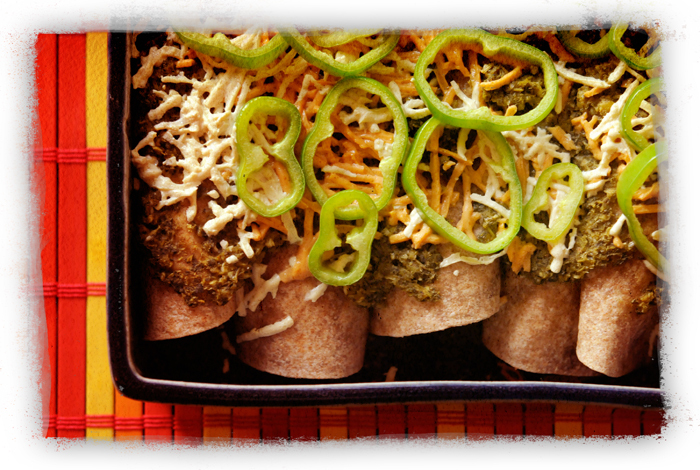 Tightly roll each tortilla and place seam-side-down in the casserole dish. Top with remaining green chile sauce and cover dish in aluminum foil. Bake at 375 for 30 minutes. Uncover and top with Daiya cheeses and sliced peppers, if using, and bake uncovered about 10 more minutes to melt Daiya and crisp everything up. Serve hot with you favorite toppings like salsa, soy sour cream, guac, black olives or sliced tomatoes. Save animals AND eat chocolate? Sure, count us in!! That’s exactly the mission of Endangered Species Chocolate. The good folks at Endangered Species Chocolate have been making ethical and tasty treats since their humble beginnings as a local Oregon chocolate shop in 1993. They’re now based in Indiana, and are still privately owned, still using only fair trade chocolate and still donating 10% of net profits to fund species and habitat conservation efforts. It’s exciting that such an ethical company has grown so much. In our area, you can even buy Endangered Species Chocolate at Target and local groceries stores, in addition to specialty stores like Whole Foods. Heck, I’ve even seen my grandmother buying these treats! We love seeing good things come to good companies! But you can still shop online with Endangered Species, too. There are several types of delicious dark vegan chocolate to choose from on their website, such as espresso bean, blueberry, raspberry, mint, cranberry-almond and extreme dark. In fact, you can even go to the vegan shopping link on the Endangered Species Chocolate website and browse several pages of vegan offerings! Umm… we’ve pretty much sampled them all. DH likes the extreme dark and cacao. Blueberry is my favorite. Want a deal? Of course you do! May 18th is Honoring Endangered Species Day. Take 15% off any products you get on the Endangered Species Chocolate website by using the code ESDAY15 at the checkout. 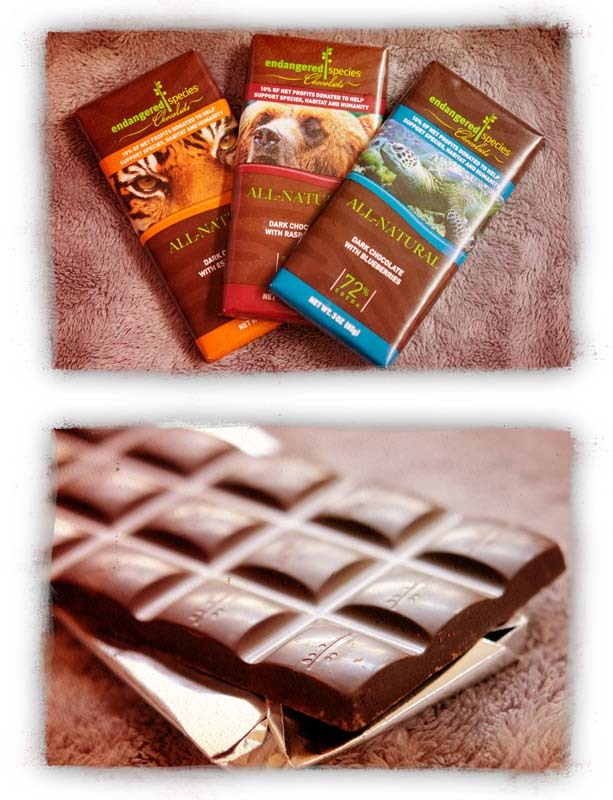 Thanks, Endangered Species Chocolate for making delectable vegan bars – and simultaneously doing so much for the environment & the animals we share it with! Something about spring makes both of us want to eat veggie burgers. Not the boxed, frozen kind (no disrespect intended, those can be fine, too, especially for a quick lunch or dinner), but the thick, juicy homemade kind. DH recently went into our kitchen and came out with these delicious creations. 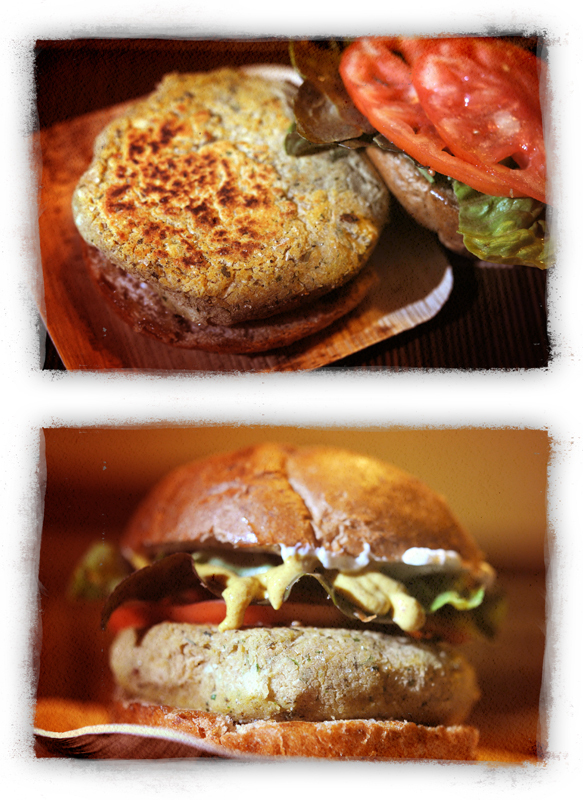 They are based on a basic hummus recipe, just altered slightly to create a substancial, tasty burger. Some days, I am convinced he is a culinary genius. If you are a fan of hummus or falafel, you’ll love these! In a food processor or blender, chop garlic until it’s fine. Add all other ingredients and combine in processor until the mixture is thick and well-combined, but not runny. It should be a little sticky and thick, not smooth like actual hummus. Form into two large patties or four small patties, depending on your preference. Cook in a skillet with a little drizzle of olive oil until warmed through and browned on both sides – or grill outdoors! These stick together well and will tolerate grilling. Serve on a hearty bun with lettuce, tomatoes, onions, pickles and your other favorite sandwich fixings. A perfect outdoor dinner! It was gray, rainy day. We wanted a little sunshine, so we made a bright yellow curry and the afternoon was saved! It’s almost like it’s smiling back at you from the plate. This curry is a little spicy, so if you prefer a milder flavor, use less of the spices to your taste. Makes 4 to 6 servings. In a large soup pot, bring 2 cups water (or veggie stock) to a boil. Add lentils and cover, cooking about 15 minutes, until tender and cooked through. If your use yellow split peas or mung beans, you may need a little less time – just check and see if they are soft. In a skillet, warm olive oil. Saute onions and carrots about 4 minutes, until warmed through, then add peppers and garlic. Cook veggies over medium heat about 10 more minutes until lightly browned and tender. Meanwhile, combine all spices with tomatoes. Mix well and add to lentils as they finish cooking. 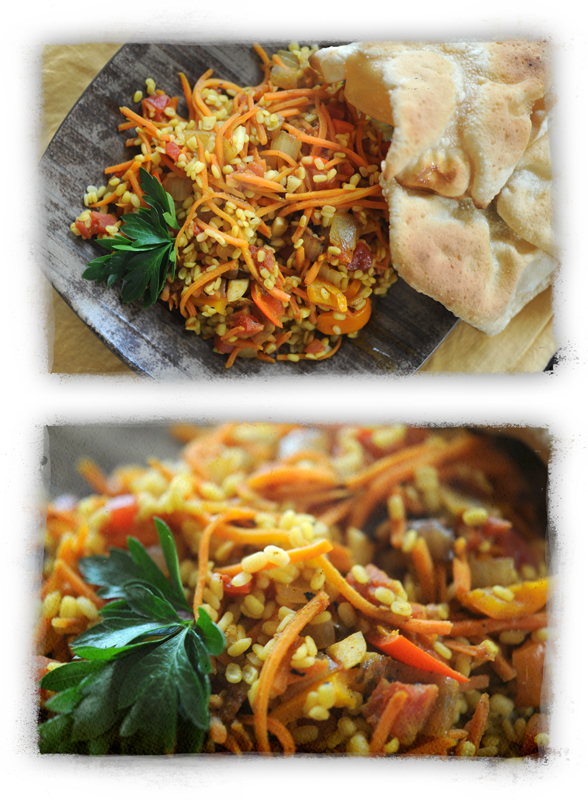 When veggies are ready, add them to the pot with lentils. Stir well and cook everything together about 3 to 5 more minutes. Serve hot with puppodums or rice, garnished with parsley. The first salad greens of spring are popping up in our garden and we’re ready for all that delicious fresh lettuce, arugula and spinach. 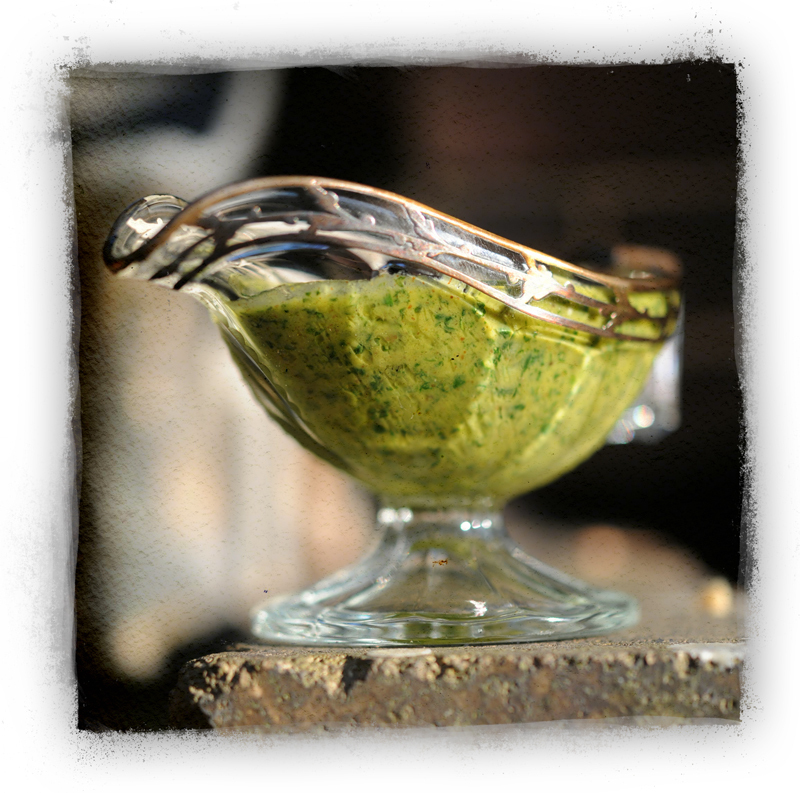 Sometimes the simplest of salads is perfectly complimented by a homemade salad dressing. Our friend Robin in Ocean City made a killer Cilantro-Mustard Salad Dressing and she was kind enough to share the recipe with us. When Robin makes this dressing, she uses honey – but that’s not vegan. So try it with agave – works like s a charm and tastes incredible. Combine all ingredients in a food processor and pulse to combine. It’s done when the garlic and cilantro are completely pureed and everything is liquified. Toss over your favorite greens or fresh salad fixins’! You can store it for about 3 to 5 days in a sealed container in the fridge. But honestly, you’ll eat it faster than that. At the start of going vegetarian, many people find tofu intimidating. Or downright unappetizing. I remember those days myself, almost two decades ago – looking at that quivering block of white mystery protein. It took some time to figure it out. But once you do, you’ll love it, I promise. You may find you come to crave it! The first truly successful recipe I made with silken tofu was brownies. That original recipe, which was torn from a magazine, has been lost for many moons. I sometimes try to guess what was in it, but to no avail. Recently I came across a tofu brownie recipe that was published in the Washington Post, and before that, Yoga Journal. So we tried it out and it’s just delicious. 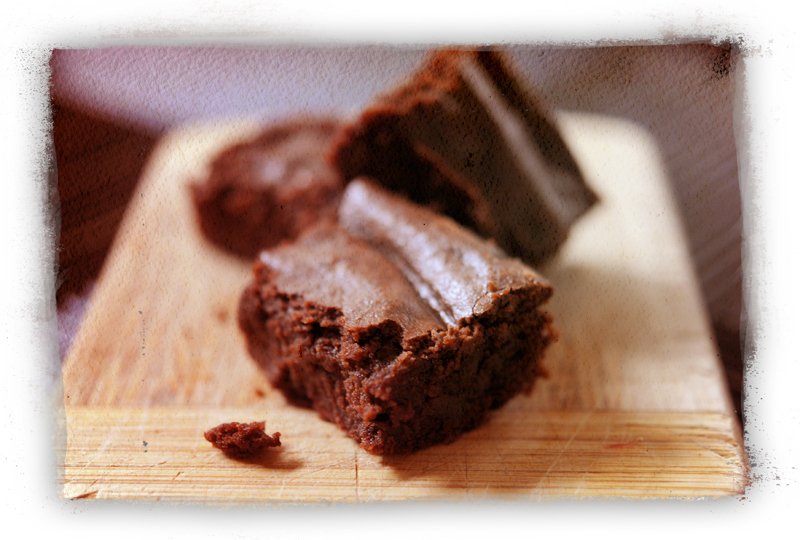 It was published under the name Tofu Brownies Rock, and before that, Triple Chocolate Brownies. Trust me – you don’t have to be vegan to love this recipe – you just have to like chocolate. And that’s almost everyone I know. These brownies are moist, simple to make, and chocolatey. If you start the chocolate melting process while you combine the other ingredients in a food processor, it all comes together very fast. We substituted instant coffee for the cayenne, as suggested in the comments below the recipe and sifted the cocoa powder. There’s only one challenging part of this entire recipe: the part where you have to wait two long hours to cut the brownies. It’s worth it though – they settle and are just as sumptuous two hours later. Oh – and the house smells like chocolate the entire time. Mmmmm… These are tasty cold, too, so go ahead and store them in the fridge. If they last that long. Alas, I can’t print the recipe here, as it’s not our original work, but you can find it here, on the Washington Post’s website. They ran it in 2009, and it looks like Yoga Journal printed it in 2008. But the recipe has aged well – and still tastes like delicious, gooey chocolate heaven – it’s a perfect beginning recipe for those learning to love tofu!